Remove any skin that may be on chicken breasts. You can use boneless if you desire. In a large fry pan, heat olive oil with the chopped garlic and lightly sear chicken breasts on both sides. After chicken breasts have lightly seared, add in your wine and the Herb Ox chicken bullion. Cover and let simmer about 10 minutes and add the water. Uncover, then allowing chicken to simmer about another 10-15 minutes, you may add in your mushrooms and stir so that the mushrooms are in the sauce. Remove chicken pieces and place in a roasting pan in a 350 degree oven. Let your mushroom sauce continue at a high simmer. Add in the 1/2 tsp. Mrs. Dash to the sauce. In about 2 TBS. of cold water stir in the corn starch mixing till you have a milky substance. Slowly mix the corn starch mixture in with the mushroom sauce constantly stirring until a gravy forms. If your gravy is too thin you may use additional corn stach mixture, if it is too thick add more water. Remove chicken roasting pan from oven and pour mushroom gravy mixture over the chicken pieces. Lay the one cup of baby spinach pieces across the top of chicken and return to oven. About 5 minutes before chicken is done lay the swiss cheese pieces over the chicken and spinach. Serve when cheese has melted. The total cooking time for the chicken should near one hour or until you are sure it is fully cooked. One thing I love is Popcorn and a movie, and when I refer to a movie most times it is actually watching a whole season of something on Hulu.com or netflix. Today is one of those days. The whole season of the new show Revenge is available for a limited time on Hulu.com So we decided that it was time to see what everyone is talking about. It used to be that movie night included extra buttery microwave popcorn, sprinkled with Parmesan cheese and little hot sauce with extra salt. A giant bowl of heart stopping snack treats. Of course those nights have had to change, but I still love the popcorn with my movie night, it is just done differently. Lets look at the calculations…A bag of Act Movie theater butter popcorn, with 1/3 tsp of salt sprinkled on top, a dash of crystal hot sauce, and 2 tsp of Kraft Parmesan cheese is a whopping 330 calories, and make sure you are sitting down for this…1840 mg salt!!! That is more than a whole day of sodium, on a low sodium diet, in one movie snack. It is almost a whole day worth of sodium by the USDA guide lines. As of the 2010 guidelines, one should consume more than 2,300 milligrams of salt per day. Those who are age 51 and older and those who are African American (almost half of the U.S. population) or have high blood pressure, diabetes or chronic kidney disease should consume no more than 1,500 milligrams per day. One of the things that make it easier to live healthy is that we got rid of the microwave. Yep you read that right, we have no microwave in the house anymore. It was a decision that has forced us to cook everything fresh and actually in turn makes shopping easier. I am not tempted by the microwave meals, popcorn, and saucy frozen dishes in the store. With no way to cook them it reminds me right away that they are “not my food anymore”. The microwave has been replaced with vegetable steamer, bread maker, indoor grill, and my favorite the air popcorn popper. In addition to the fresh cooking methods, the other thing that will soon become a staple in any flavorful low sodium diet is Mrs. Dash No Sodium Seasonings. They come in so many great flavors, from Caribbean, to steak and chicken grilling seasonings. My favorite of the Mrs. Dash line is by far the Fiesta Lime!! I use Fiesta lime on many things fish, chicken and most of all….Popcorn! It is the key ingredient that gives my air popped popcorn that kick of flavor. Now a days, instead of loaded with cheese and butter, and calories and sodium my popcorn is loaded with health and flavor! Lets see the difference in the numbers. 5 cups white air popped popcorn, with fiesta lime Mrs Dash to taste….100 calories and 0mg of sodium. If you like the butter flavor, which I do like to have sometimes, you can hold the calories, fat and sodium by using spray butter. I like either Parkay or I Can’t Believe It’s Not Butter spray. Just be careful and read the fine print, yes 1 spray has no calories or sodium, but 5 sprays have 15mg of sodium. So if you are like I am, you like to put a good coating of butter flavor on your bowl of popcorn. I use about 50 sprays to coat 5 cups of popcorn, that still only adds a minimal 150mg of sodium. Still much better than the 1800mg popcorn alternative. So reach for the air popper, the spray butter and the Fiesta lime and curl up to a movie and a snack and enjoy, Flavor, Healthy and Salt free! Had a super fun time being creative for dinner. 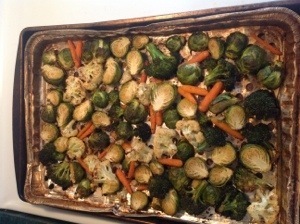 Decided to go with a vegetable dinner, since my fridge is freshly stocked with great fresh veggies! Cut eggplant in half lengthwise, with a sharp knife, cut diagonal slices in the meat of the eggplant in crisscross pattern. Do not cut thru the skin. You are making a checkerboard of packets to put veggies in. Spray surface of cut eggplant with spray butter. Cut mushroom, garlic, squash and sweet peppers into thin slices and stuff in to the slices in the eggplant. Fill eggplant halves with as much vegetables as you like and can fit. Depending on your preferences put whichever flavors you want more of…I prefer to load up on more mushroom and garlic. All of these vegetables are so low in calories, and natural sodium content that you can have good flexibility with them. After stuffing the eggplant, sprinkle with tomato basil garlic Mrs. Dash, and dash each half with a teaspoon of Worcestershire sauce. Place the 2 halves back together and wrap with foil. Place foil wrapped Eggplant on baking sheet and bake in oven for approx 1 hour, or until the meat of the eggplant is soft all the way through. Unwrap the eggplant and separate the halves. Top each half with tomato slices and 1 Swiss cheese slice on each half. return to oven uncovered, continue to cook until the Swiss is bubbly. Remove from oven and let cool a little bit, as a dinner you can server a half an eggplant per person.